Wine importer London Whitley dots her I’s and crosses her T’s. Her meticulous nature insulates her from her fears that she might just be crazy, as in certifiably, medically nuts. When her almost ex-boyfriend winds up dead at her hands and she’s soon accused of importing counterfeit wines, London’s carefully constructed world begins to crumble. There’s help to be had, but only in the form of an imposing stranger who threatens her ruin. 4.5 stars; I was hooked! My heart broke for Trevor in Art-Crossed Love. That's why I was so excited to see Libby was writing another book and he'd have a shot at his HEA. I'm not going to lie, I was really looking forward to this book and I was really quite happy with the story he got. Was it perfect, no, but it was really close to it. It hurt to see Trevor this way. He's a lot more closed off and suspecting than he was before, but that's a given considering everything he's been through. I did like how London brought him out of his shell. I loved how he was with her. Even though he was distrusting, he really took her feelings about relationships and attraction to heart. I felt horrible for London too. Not only did she have to deal with the fact her business was in serious trouble, but she'd had to deal with some epic romantic fall out too. I liked London as much as I felt sorry for her. She's honorable and willing to do what it takes to get to the bottom of what's threatening her livelihood, reputation, and the health of others. I liked how she and her sister depended and defended each other. There were a few revelations that took me by complete surprise. I would've never in a million years have thought they were possible. They certainly shed a new light on things. I also was intrigued by the interaction between London't sister and one of Trevor's friends/bosses. I wonder if there is a story there and the both of them can be redeemed. Story wise, I was hooked. There are so many ups and downs and it seems like everyone has a personal agenda they were trying to push. I really enjoyed the mystery/suspense part of the story. I felt like it was written really well. While I enjoyed London and Trevor's chemistry and the mystery they were working to solve, I felt like there were bits and pieces of the story that weren't handled as thoroughly as they could. I would love to see more of them in the future, in perhaps another Second Chances series book. If you haven't read anything by Libby Rice, you're missing out on some amazing angsty romance with suspense, and a great read! Love Drunk is the story of Trevor Rathlen and London Whitley. 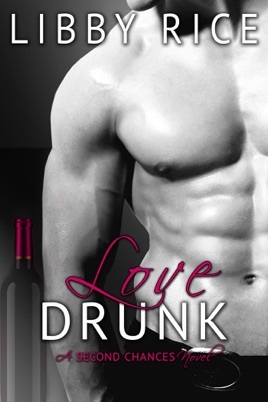 Trevor is introduced in Art-Crossed Love, Ms. Rice's first book in this series, but Love Drunk is a stand alone book. I loved every page! The author skillfully made Trevor a gentle giant and one hot guy! London, a wine importer with a mysterious counterfeiting problem overtaking her stock, has gone through a heartbreaking past relationship and a tedious upbringing. She's a more vulnerable heroine than in the other two books in the Second Chances series. It was fascinating to watch London grow into her own strength over the course of the book. The counterfeiting subplot that brings Trevor and London together is unique and obviously well researched, and the characters come across as authentic and genuine, flaws and all. What I love most (about Love Drunk and Ms. Rice's other books) is her skill with words and how she finds ways to weave romance (again, this is a steamy book), suspense, and humor!